Black Alice's powers are out of control. And the only thing that may save her life (and the world) is the destruction of four magical columns. At least, that's what the ancient Atlanteans in the robes who just showed up claim. But can they be trusted? Or are the magical super-villains who were trying to kill Alice telling the truth when they say the pillars must be protected if the world is to survive? And can the rest of The Six really entrust Alice to the care of the assassins who were trying to kill them several weeks ago while they deal with sorting all this out? 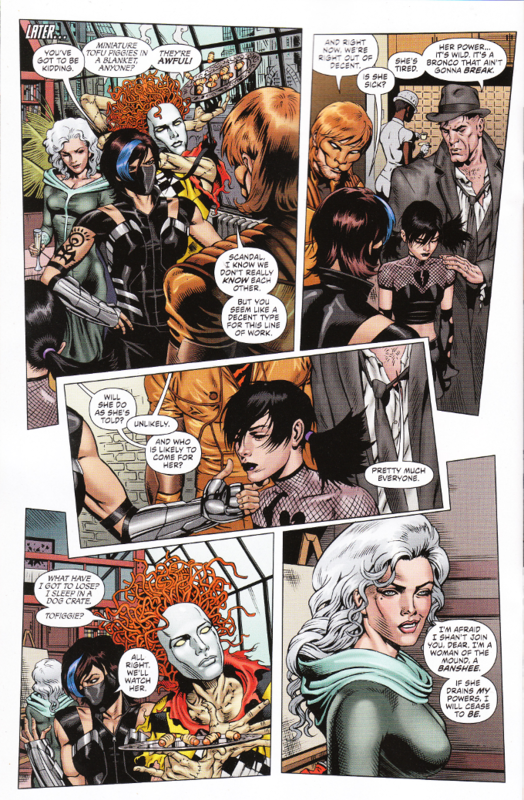 The only real flaw to Gail Simone's script for this issue is that you have to have read the previous Secret Six series to get the most out of it. Granted, that's a minor concern as most of the people reading this series are probably devout Simonephiles. And a little confusion is a small price to pay for the return of Ragdoll, Jeanette the Banshee and Scandal Savage... though this runs the risk of making the book's title even more inaccurate. But that's all part of the fun. The artwork proves equally fine. Tom Derenick and Dale Eaglesham are at the height of their power here. And Jason Wright makes everything pop on the page with his color art.